Four members of the Luxury Lodges of Australia have taken the top awards in Australia in the Conde Nast Traveler 2018 Readers’ Choice Awards announced today, with Southern Ocean Lodge, Longitude 131°, qualia and Saffire-Freycinet ranking among the best hotels in the Australasia and South Pacific region. 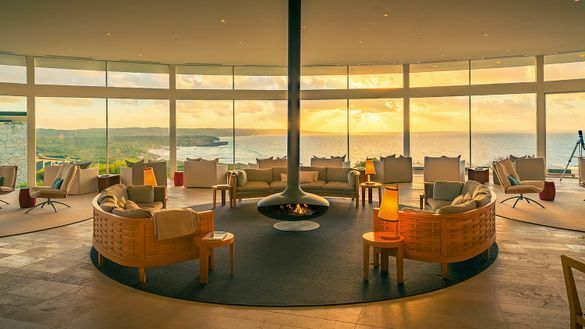 Baillie Lodges’ award-winning Southern Ocean Lodge on Kangaroo Island has ranked 98.81 from a possible 100, claiming best Australian Resort and third place in the Australasia and South Pacific. Sister property Longitude 131° at Uluru-Kata Tjuta was hot on its heels with a score of 98.21, placing the property in second place in Australia and seventh in the region, delivering a double win for the Baillie Lodges’ collection of Australian luxury lodges. Hamilton Island’s celebrated resort qualia has come in third place in Australia with 94.97 while Saffire-Freycinet has gained fourth best place with a score of 92.86. More than 429,000 readers submitted millions of ratings and tens of thousands of comments, sharing their recent travel experiences of the world’s cities, islands, hotels, resorts, cruise lines, airlines, and airports. Luxury Lodges of Australia Executive Officer Penny Rafferty said the recognition in the latest round of Readers’ Choice awards reflected the growing popularity of a uniquely Australian breed of experiential luxury with travellers from around the world. “Condé Nast Traveler is one of the world’s best-recognised and most respected titles and we’re thrilled its readers have shown their support for these remarkable lodges in their wildly beautiful destinations,” Ms Rafferty said. “We consider the awards a reflection of the compelling appeal and quality of the Luxury Lodges of Australia properties. Editors’ Notes: Luxury Lodges of Australia (LLoA) is a collection of 19 intimate luxury lodges in unique Australian destinations. Each member property offers guests a luxury base from which to explore, a unique and personal experience of the destination, with the chance to connect with the landscape, wildlife and local culture. A stay with LLoA is a chance to step away from the busyness of the everyday and connect with like-minded travellers. A sustainable approach to the environment, the community and culture is key to each lodge’s operations and to a genuine, often life-changing guest experience.